Location: An isolated hilltop church in a walled churchyard, on the E side of a minor road between Brechfa and Llanybydder. 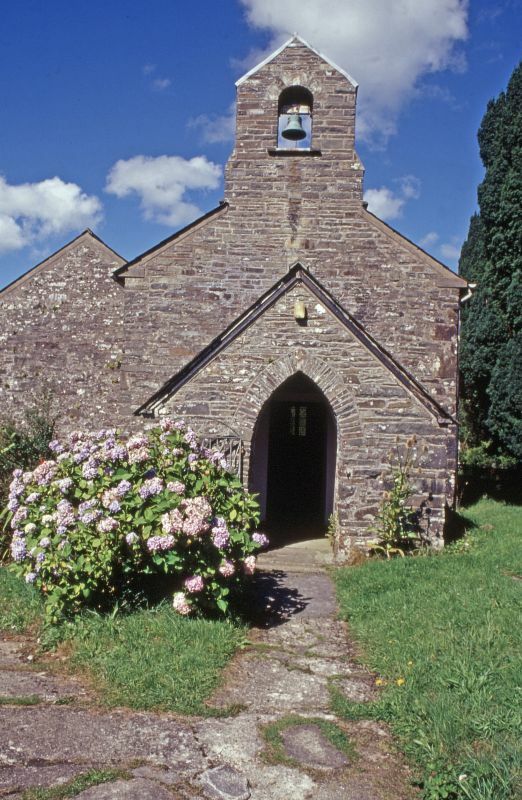 A medieval church first mentioned in the late C13 and a chapel-of-ease in Llanllwni parish. It was a parish church by 1833. The structure is medieval with a late medieval S aisle, although external openings date from a restoration in the early 1850s. Further minor restoration of 1907 was by E V Collier, architect of Carmarthen. An Early-English style church comprising nave and chancel under a single roof with W bellcote, W porch and a S aisle with chapel shorter than the nave and under a separate roof. Of rubble stone with slate roofs. The openings are all C19, of which the 2-light windows have Y-tracery. The S aisle has a doorway in a projecting hammer-dressed stone surround, with a pointed head and hood mould to a boarded door. To its R are 2 windows with hood moulds. The E walls of aisle and chancel both have similar hooded windows but on the N side of nave and chancel 3 similar windows are without hoods. The gabled porch has a pointed doorway with narrow voussoirs and C20 iron gate. The square-headed W door to the nave has a boarded door. The C19 bellcote has a single bell in a round-headed opening with hammer-dressed voussoirs. The interior has suspended ceilings obscuring the roof trusses, which are said to be C19. A 3-bay S arcade has simple plastered 2-centred arches. The late medieval plain octagonal font is on a stem but the base is missing. The C18 pulpit has blind Gothic panels with painted sunflowers in relief, on a base of clustered columns. Benches have simple ends. The communion rail has turned wooden uprights with brackets supporting the rail. The sanctuary has plain and encaustic tiles. Listed as a simple late medieval church on an upland site characteristic of SW and mid Wales, with good interior detail, including font and pulpit. Approximately 300m SW of the parish church, set back from and below the S side of a minor road between Gwernogle and Llanfihangel Rhos y Corn.